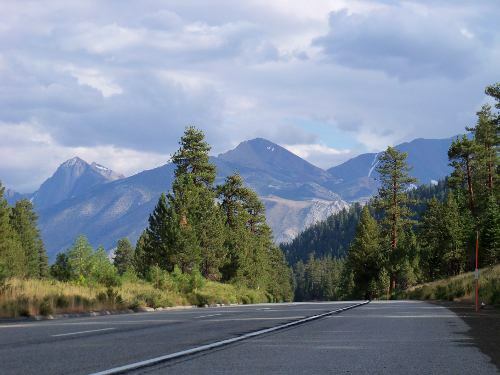 Above image: This is the view from my recumbent trike as I pedal south through the eastern Sierra Nevada mountain range in northern California. The shoulder is wide, and the views are awesome. As you push your first pedal to depart on your first overland odyssey, a trek across distant lands, it becomes immediately and often unnervingly apparent that you have just entered an alternate state of existence, a new dimension of unknown outcome. You’ve just thrown everything you know and live by right out the window. All your securities vanish within a few feet. All your comforts are gone. All your routines have been tossed to the winds. Things your society has taught you may vaporize. All your guarantees are canceled. You’re definitely not in Kansas anymore Dorothy! Welcome to the frightening, yet wonderful land of Oz. And yes, it does have the sense of a tornado the way it all unfolds, especially the first time you head out on your first trike adventure. Everything is still pretty much tolerable the day before embarking, and even that evening, the mind is not overly worried, as it is engaged with checking and rechecking everything to make sure you are good to go tomorrow. But when you wake up on judgment day, the winds of worry start to swirl. It truly is judgment day too, because you must judge whether or not you really are going to commit to what you’ve laid out before you. It’s still possible to scrap the mission after all. You haven’t left yet. Just say no and don’t go. That’s one nice thing about not telling anyone about your trip ahead of time. It’s easier to cancel. There is no bruised ego with which to contend. Realizing this, my mode of operation has historically been to put the advanced word out in a big way, not only to my family and close friends, but also on this website. Now everyone knows. Why did I do that? It was precisely calculated to keep me motivated to move forward despite those awful fears that were marginally being kept at bay in my self destructive thought processes. Fear is undeniably powerful, but, alas, so is the ubiquitous ego, thus through announcement, ego suppresses fear. That was my personal battleground. To break free of my old boundaries I had to devise a plan capable of transporting my fearful mind into new dimensions. Of course, you want to go despite reservations! No one would come this far with all the detailed preparations if there had not been a dedicated desire to make the trip. A lot of money has been thrown at this project too. Overland trike travel is not cheap, especially if it’s primarily a side interest for you, or if you stay in motels and eat at restaurants. If you’re one of those rare folks who has exchanged petroleum power for pedal power however, then cost is a relative aspect of it all, as trikes are far and away more economical than automobiles in many ways (initial cost, repair, insurance, driver license, etc). Clearly you want to take this journey, and the fact that you’re reading these words proves it. This is precisely where you are “supposed” to be right now because this is in fact where you are! What’s it like the morning of going away? Where are you going away to? What’s out there? Your freedom? What mental monsters are going to devour you for breakfast? And if you successfully evade their hungry jaws, are there more later on? Or does each day get easier? How long does it take to adapt to this new and very alternative reality you’ve designed for yourself? The quick answer is that it does not take too long really. When you are pedaling along the road during the first morning of the first day, especially if there are some good uphills early on, you are too busy moving ahead physically to be bothered with stagnating mentally. The physical activity keeps the mind positively engaged. Your fears will likely surface once again at your first night’s camp if you are alone and pitching a tent somewhere, but each successive night gets easier. If you’re tired enough after pedaling all day, and you drop off to sleep rapidly, that’s less time for the anxieties in your head to assail your brain. We’ve talked a lot about fears before, and for good reason because most of us are secretly, or not so secretly as the case may be, full of them. Fears are “ride stoppers” for most trikers. 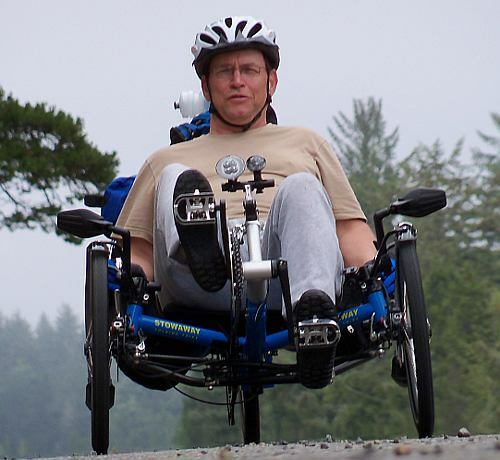 Even if the trike and body are ready, the mind rarely is on the first-ever journey. One fear we haven’t addressed yet is the simple fear everyone has at some level of consciousness, and that is the fear of being different from everyone else, or at least how we perceive everyone else to be. Most of us want to fit in, to blend with the crowd. Did you feel self conscious the first time you rode your trike on the public roads? Was it a challenge to be seen on a tricycle as an adult? I know I felt it. All throughout the course of human history, those who are different than the pack have been singled out, usually in a negative way. Those who don’t fit in to the collective’s model of expected behavior have something wrong with them. That is their fear of you forging a fear of them in your mind. The good news for trikers, especially overland trikers, is that we get over most of that immature nonsense rather quickly, typically because there was already something different about us that led us to triking in the first place. Riding a tricycle in public, knowing full well most people think tricycles are only for children or the physically disabled, was our first boundary on three wheels that was shattered. We entered life on the other side of that perceived limitation, and eased into the brand new dimension of freedom from gasoline. After a while getting used to our new image, we came to enjoy our difference from the pack. Our reality was beginning to gradually change. Reality truly does change even more immediately on the commencement of an overland journey. The first thing that commonly hits us is concern about motorized traffic. As the miles roll by however, and we realize that cars and trucks are not striking while triking and killing us dead, this imagined reality of survival fades. By the end of the first week, it has largely been vanquished to the garbage heap, which is precisely where it belongs! Then there’s the feeling of loneliness in this new reality, which is initially pretty extreme if going solo, but muted if with at least one other triker. On your own, your mind has a tendency to keep playing the same broken record of woe is me, I’m all alone out here. But the mind is amazingly adaptive in new situations, and is more than up to the task or accepting and dealing with the activities in which it finds itself engaged. Remember, fears are in the head, not in the world before you. Our imaginations are what mess us up. If you are with another triker, the loneliness aspect may not even rear its ugly head. Just having someone with whom you can share the trials and tribulations is a wonderful psychological boost. The trip where I headed out with Gary and Glen was considerably less stressful on departure day than my first solo trip a couple years earlier. Humans feel safer and superior in groups. We join clubs, churches, and political parties so we can feel like we belong, in places where we can feel strong, even if we perceive ourselves as weak. With a fellow triker there is at least someone else to keep the demons away at night as we set camp and the woods get real dark. Even as adults, we are still very scared of the dark. It never goes away completely. Horror movies may have had a hand in things, because reality sure didn’t cause it – monsters don’t get us at night as we were taught. Our new unconventional dimension provides an unparalleled sense of freedom too! Here you are, moving across the natural landscape under your own bodily power. How cool is that? This freedom is accentuated by the silent movement your trike makes compared to motorized cars and trucks, which become an audible annoyance as their tires whine by. But even their incessant high speed dissonance of rubber on pavement becomes nothing but unconscious white noise after a while, even if you don’t have an iPod cranking out the tunes in your ear. The trike quietly slices through the low airspace, and you are free from paying oil companies for the privilege of driving somewhere. You are not harming your home, this third planet from the sun. Instead, you are becoming at one with it in a way you could never previously imagine. There is no explaining this. You have to feel it first hand! You will feel good about what you’re doing. 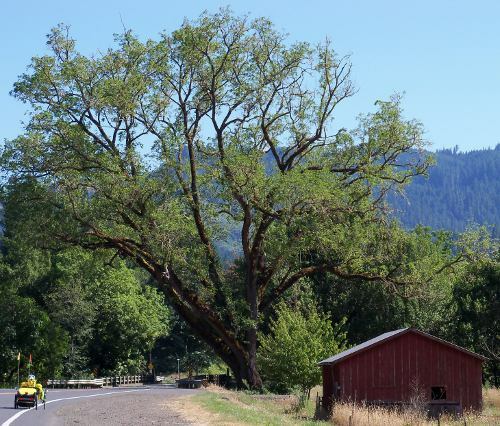 As you ride on the shoulder, on the edge of the road and reality, you can reach out and let your hand brush against the little trees and flowers that sometimes line the roadway. You can talk to little animals who pop out of their holes to curiously observe you rolling by their home. You can watch in exhilarating humor as horses run along side you in their pastures, attempting to identify this strange little vehicle. And pedaling along at the same level and speed as a flock of geese just skimming the river to your left is one of the most amazing events you could ever hope to experience! Rains water you now and then, something you never felt in a car. I’ve lived all this. You will too. What a wonderful world it is. Yes, once the overland triker can move past fears that used to paralyze the mind, a whole new world emerges, but, make no mistake here, that world does not show itself until you begin to seriously let go of your fears! Riding a trike across vast territory is like no other mode of transport. It is a universe parallel to that of everyone else. 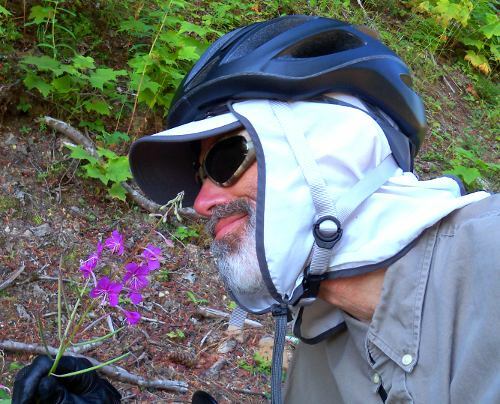 You are comfortable for one thing, with none of the issues typically associated with bicycle touring. Human powered bikers have yet to learn what they are missing, and as you notice some on the road, you almost feel sorry for them. Somehow, you were lucky enough to evolve into a trike, a rig that, contrary to beliefs of naysayers and the uniformed, are not just for old and feeble people with severe balance issues. I am not old and feeble, nor do I have balance issues. I am young and strong, and wash my feet in the shower while standing with no other support (yep, that means on one foot). Guess what happens the first time you pass by a serious two wheeled cyclist going down a mountain. 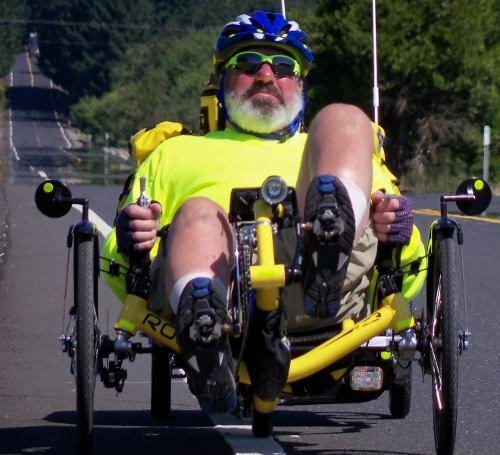 Trikes, especially low and aerodynamic ones, will rip past a traditional bicyclist, thereby instantly changing his skewed reality in the process. This is because there is a common notion amongst the elite carbon fiber bikers that trikes are slow, and ridden only by old and feeble people with severe balance issues. Surprise! See you at the bottom of the mountain range. No new endeavor could ever be commenced if a person had to first answer every possible objection that could be raised against it. And as you likely already know, your friends and family have, or soon will, toss out a seemingly endless tirade of things to worry yourself sick about. Keep in mind however that these same folks who are just trying to help save you from yourself have never been in the alternative reality of pedaling a tricycle across the Earth. So how do they really know all that they profess to know? The reality is that they certainly do not have a clue! Thus, you are a new world explorer of sorts. They all look upon you as another Christopher Columbus, sailing towards the edge of a flat planet. And guess what! You will see yourself in that same light on your first voyage. You have little idea of what to expect, so just like Chris, you boldly head perpendicular from the shore, away from all that is known, and into the vast newness of the uncertain. There will be imaginary monsters out there of course, but trikers are a tough lot, and more than up to the task of meeting them head on and winning the day. You are a real animal, tough as nails. 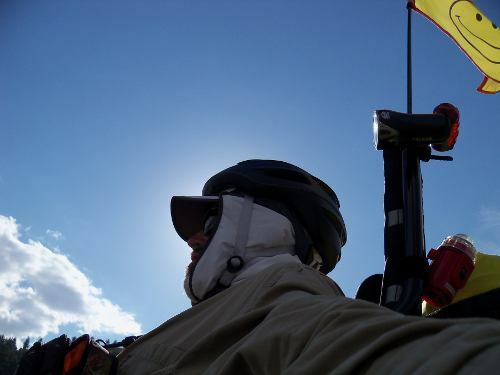 Why do I consider triking overland an alternative reality, a realm of new dimensions far beyond one’s prior boundaries? Well, for starters, virtually no one else is out there doing it! You can’t be much more alone than that, right? You are on the edge of what you thought you knew. I once rode my trike over the Cascade Range in Oregon through the middle of the night in the snow, and I thought to myself, hey, no one else in this entire country is riding a tricycle tonight across a mountain range. I was absolutely certain of it. In fact, with a reasonable amount of assurance, no other human in the entire history of humans on this planet has ever pedaled a tricycle over these mountains through the night, and the exploit is unlikely to ever be attempted again (it was crazy for sure). That was indeed an alternative reality in the frozen white moonlight, with nary a sound but my drive chain moving through the chain tubes. That cold night, I pedaled past many former boundaries in my head. Yes, I did feel a kinship to Mr. Columbus the next day, and ready for more. That example serves to reveal the truth that trikers are a maverick bunch of pedal pushers who are always open for surprises. We learn to relish the unknown, to seek out uncertainty with a vibrant existence that makes it a welcomed adventure. We are alive with a nomadic spirit. And when our final time here does one day arrive, we are content that we have truly lived. In reality, life for any human is liberally bathed in almost complete uncertainty, but, due to our protective cultural institutions, this fact is mostly ignored. We are protected by police, military, doctors, politicians, and gods. Our futures are assured. Our lives are boring. But we are safe, or so we think anyway. Our realities are guaranteed in the form of batons, bombs, medications, promises, and prayers. If we choose to become a gypsy roaming the land on a tricycle, we open our eyes of necessity, and relinquish the imagined certainties we thought we had. Our lives change in many ways. On an overland tadpole tricycle odyssey, we human powered humans use the same roads as the petrol based humans, but our views are entirely different than theirs. They see a world outside their windows, but they don’t hear it. They don’t smell it. They don’t touch it. In fact, maybe they don’t even see it. What they are intently focused on are the road signs, surrounding traffic, and arriving quickly. Their world, their dimension, is fixed, frozen according to what their culture has deemed necessary for them. It is too psychologically perilous for that collective to consider leaving their reality and seeing other parallel universes, such as ours. Yes, we pedal alongside these people in their convenient climate controlled cars and trucks, and we may end up in a similar physical location, but our journey to get there is so far removed from their hasty trip that they just stare at us in disbelief as they pass. We might as well be on another planet, because what we see, hear, touch, smell, and feel are light years away – light years ahead, in my opinion. We travel beside, yet couldn’t be more distant. Our dimension is low and slow. We see time in the present moment, not as an obstacle to speed beyond in order to reach a destination. The journey itself is our reward, and when we finally do arrive somewhere else, we rest, share our adventures, and soon realize we are compelled to return to that magical triangular universe that has captured our imaginations and sent our spirits soaring. It is our escape from what our world has become. We pedal past our old boundaries into a world that is anything but ordinary and boring. We instinctively realize this when we first pedal away from home. We know it has all changed. Each day on the road, it is obvious that our dimension is “out there” compared to normal people. We live, breathe, and eat adventure at every turn. No journey is routine. We feel like pioneers, only with modern conveniences available to help us along, important because we too were brought up in modern ways. Our world is one where we make it over the next mountain range by pushing our muscles to the maximum, by fueling our bodies with food and water, and by focusing our minds on voluntarily traveling in a way that, by any rational standard of contemporary human normalcy, is somewhat demented. We do the work. But while they suffer from acid reflux, osteoporosis, elevated blood pressure, occluded arteries, adult onset diabetes, cancer, and an unending host of other frequently preventable maladies, we continue to build our bodies and minds to power us beyond the passing of our contemporaries. We may be nuts, but we are very healthy nuts at least. One night, I pedaled on a mountainside for 19 miles, along a river below. A full moon lit the road and my world. My headlight was off because at my speed, I could see well enough to travel. Due to pine trees, the river would not have been visible in many places even if it had been daylight. A car driver would have experienced nothing but pavement that fell in front of his headlight beams, and the drive would have been over after about 25 minutes. He would have only heard his engine and perhaps a CD playing on his stereo. This stretch took nearly 4 hours for me to complete due to the steep uphills and my heavy trailer. I felt the crisp night air, and the chill as I coasted down certain portions of the ride. I saw fleeting glances of eyes off to the side every once in a while as my rear visibility strobe reflected from the pupils of feral animals curious about my silent nocturnal passage. I heard the powerful gurgling rush of the water down below, my only clue that a river was coursing westward out of the mountains in front of me, beautiful sounds amplified by the cold and dense night air. How many people have traveled this road with these sensory experiences? And at night? Very few! I did indeed feel like I was one in a million, privileged to behold such things that I never knew during all my decades of auto ownership and hurried harried travel. I was in a theretofore unknown dimension of life. It was so indescribably incredible that later on that same trek, I took other night rides. I still enjoy waiting for warm moon lit nights on my odysseys so I can proceed even deeper in the world of special existence known only to the overland triker. If you think riding a trike is neat during the day, just wait until you try it at night. We all have our routines. Many of us awaken each morning before dawn to the sound of an alarm clock so we can get up groggy eyed to a cup of caffeine. We switch on the radio to the latest ugly news of our culture, which then blares into our brains while we prepare ourselves for a day at the office, perhaps a tiny 7×7 foot cubical that separates us from our coworkers. All day long, as we work at a job most of us are doing only to obtain money so we can acquire an ever increasing amount of personal possessions, we eagerly await the magic hour to go home once again. The drive home puts our automobile squarely in an endless sea of other cars, sometimes moving along at a runner’s pace. Then we eat a fattening dinner, plop into the easy chair, watch some questionable television, and fall exhausted into bed with acid reflux so we can start the identical process again in six hours. We do this for decades. Are we imprisoned by boundaries here? 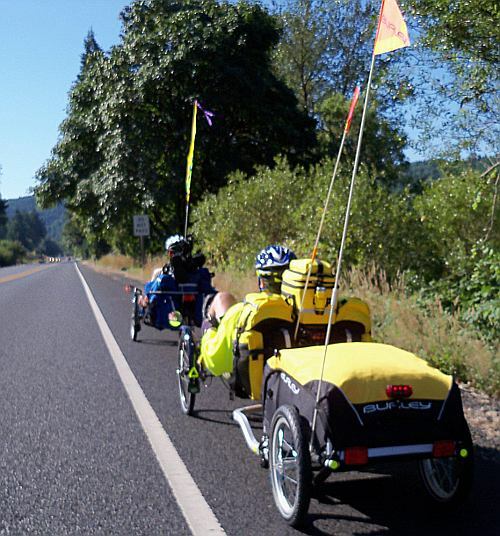 How does this typical routine compare to that of an overland trike gypsy? Well, we still are likely awakening around dawn, but instead of the alarming clock, it is because we have slept soundly for the past 10 hours, and our bodies simply do not need further sleep. We awaken refreshed, having slept at least 4 hours longer than the average worker of wealthy nations. We don’t need caffeine to jump start ourselves, which is a very unhealthy habit anyway as it chemically speeds up one’s heart rate and raises blood pressure. The crisp cool morning air outside the tent is totally refreshing, totally natural, and totally healthy. We are awake fully because we are not groggy or wiped out from the daily grind of progressive society. We actually want to be active to warm up. We are not fed a steady stream of negativity designed to up a radio station’s ratings and income. In fact, we forget about all the stuff that powers the wealth acquisition habits of the masses. All around our humble gypsy camp are the beauties and mysteries of the natural Earth, so we are never alone out here, even though another human may not be present. Birds sing to us. The sun shines on us. The clean air nourishes us. The serenity fulfills us. We start to realize what we have been missing each day while mindlessly racing towards some perceived important goal in the urban graveyard. Compare all this natural wild expanse to a 7×7 cubical that only has views of 3 gray carpeted walls. Overland trikers have trees, bushes, boulders, rivers, sky, clouds, animals, and freedom. This is our “workplace” while pedaling the territory at our own speed and whim. There are no deadlines. We are free to leave when we please, ride as far as we please, rest when we please, do as we please. There are no traffic jams. Even if we find ourselves riding through a big city on our journeys, our little trikes keep moving forward when the cars are stopped in gridlock. We move to the head of the line every time. While we are pedaling through the wide open spaces, we think of our coworkers stuck in their socially imposed boxes of expectation, and we begin to wonder if we can alter our lives to somehow include more of this new found freedom. Are we missing unseen options? We mentioned deadlines a moment ago. That is an interesting compound word that includes dead. The boss expects all your work to be complete prior to the dead line, or prior to your death by overload, whichever comes first. Might want to pencil in death on your calendar. It’s always good to be prepared, especially since death comes early to those stuck in tradition. It’s not my opinion either. Just look at the statistics! Insurance companies and retirement plans base everything on an early statistical demise when compared to longevity facts. Overland triking allows plenty of time to think all this through. A few uncommonly perceptive trikers finally do something about it. As the sun gets closer to the western horizon, we begin our search for potential overnight solutions, having spent the day bringing our minds and bodies back to a natural balance and focus. We are living in a manner designed to enhance and extend life, not choke it. Dinner is happily eaten. The day allowed forward progress, not only in miles across the countryside, but also in ideological enlightenment. You are an overland triker! Be at peace regardless of how others perceive or judge you. Be happily different. Have confidence in your path, no matter how bizarre it may seem. Chart your own course, both on the road and through life. Never be in a hurry to arrive at your destination, for in reality, that destination is nothing more than your next departure point. Enjoy the ride. Enjoy life. Pedal far! Oh yes, and don’t forget to smell the flowers that keep you company just off to the side of the road. Small delights bring large rewards.